Coalition Work Featured in New Road Ecology Book! 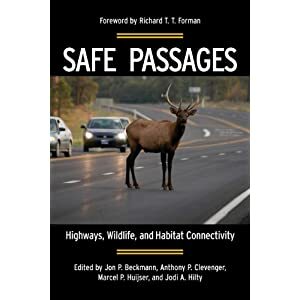 Safe Passages: Highways, Wildlife, and Habitat Connectivity (Island Press) has just been released! Coalition staff members, Carolyn Campbell and Kathleen Kennedy, contributed a chapter to this exciting new publication. The chapter is entitled "The Sonoran Desert Conservation Plan and Regional Transportation Authority: Citizen Support for Habitat Connectivity and Highway Mitigation." Copies are available at amazon.com. The Arizona Heritage Alliance present this film which showcases the natural, cultural, and historical treasures of our state parks, the current outlook for our parks, and what you can do to help save them. To be held at Crossroads Grand Cinema at 4811 E Grant, this event is free to the public, doors open at 7pm. For more information, contact Bill Thornton at 520-795-6028 or cactusworld@msn.com. This race features 8-mile and 2-mile courses looping through a cactus forest in the foothills of the scenic Rincon Mountains at Saguaro National Park East. This event has been featured as a Runner’s World Race of the Month. The Coalition is honored to be a beneficiary of this event, and we hope to see you there! Create a team or pledge a donation to help support the Coalition: we are planning challenges to encourage you to "Run for the Coalition!" Visit our website over the coming weeks for more details. Early signups receive a discount! For more information, visit the Southern Arizona Roadrunners website. This amazing event to be held at Tucson’s Loft Cinema features films that will reach the audience through beautiful imagery and inspire individuals to get involved in conserving the Wild & Scenic places close to home. This night will will be full of fun and excitement. Tickets on sale soon! Keep track of all the action at the event’s Facebook page. If you are interested in helping as a volunteer or contributing to making this event a success, please email gabe.wigtil@sonorandesert.org.